Addictive Keys is a powerful tool for musicians, producers and songwriters, setting a new standard for virtual keyboard instruments. 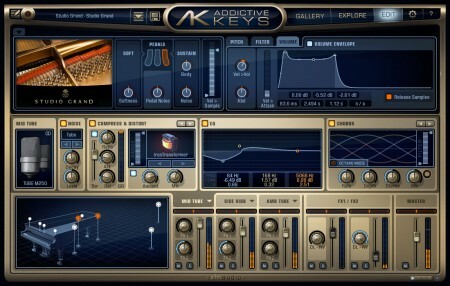 With its unique sound creation ability, smart workflow and fast loading times, Addictive Keys is the ultimate blend of engineering, innovative design and creative expression. Mix and match different microphone perspectives, add effects and advanced envelopes to create truly unique sounds - it's suitable for any production style or music genre. The standalone version is perfect for spontaneous jamming and live performances and the plug-in version supports all major DAW hosts.